For all 1991 and newer models with the horn bracket below the gas tank. 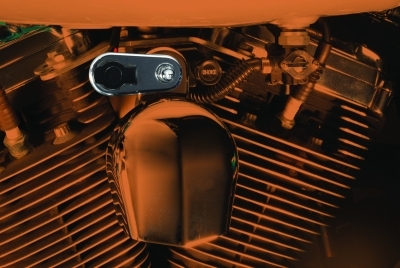 High quality show chrome PKT-026-C bracket with vibration proof Powerlet® socket. Many patented (or pending-pending) brackets create a truly unique product line not found elsewhere in the world. Designed to provide a factory installed appearance, it is obvious we must be nuts to produce special brackets for bikes like Moto Guzzis with 70's Tonti frames. Our goal as enthusiasts is not to just produce products for the "most popular" bikes but rather produce products for "your" bike. Only an real motorcycle lover would work hard, stay late and produce a product for a handful of other enthusiasts. While these kits take only 20 minutes to install, they provide years of use for battery charging, heated clothing, cell phone charging and more. The wiring harness lengths are also produced specifically for the vehicle. Powerlet simplifies the purchase and implementation of today's technologically advanced electronics by offering the most complete, expertly engineered, interconnects and appliances. This enables our customers to enjoy a lifestyle utilizing convenient modern electronics.